The review article written by Dr. Serkan Göktuna and his team from the Department of Molecular Biology and Genetics appeared on the cover of the FEBS Journal. The FEBS Journal, the official publication of The Federation of European Biochemical Societies (FEBS), is a prestigious peer review journal which covers prominent research on all aspects of biochemistry, molecular biology and cell biology. This review summarizes the current understanding of the conventional and non-conventional functions of IKKs, the direct upstream protein kinases of NF-kB in cancer development process through an important compilation of recent works using genetic disease models or transgenic animal models with the latest techniques. NF-kB transcription factors are the central hubs of the signaling pathways that connect pro-inflammatory signaling to cell survival, proliferation and cytokine production. In cancers, NF-kB signaling influences many aspects of tumor development, from initiation to metastasis. These functions are mediated by tumor-induced plasticity that allows tumor cells to adapt and survive the evolving conditions within the tumor microenvironment. Among many articles associating NF-kB signaling with almost any cancer in the last two decades, there were only limited number of studies that provide mechanistic insights into this NF-kB involvement, and even only a few of them described the roles of IKKs in animal models of tumorigenesis. Since the use of genetic disease models and transgenic animal models would be best to elucidate the complex regulations and interactions within tumor microenvironment, for this review, the authors selected recent in vivo studies, classified in individual types of cancers, to demonstrate how canonical or non-canonical IKK functions affect tumor cell plasticity. The authors hope that by summarizing achievements and shortfalls in this research subject, this review will help the research community better comprehend the current status of the IKK research and initiate further studies in IKK related cancer investigation. Since inflammatory pathways are the very source of plasticity within tumor, it is very important to have a better understanding on regulatory pathways in inflammation-driven tumorigenesis in order to develop more advanced strategies to tackle cancer. 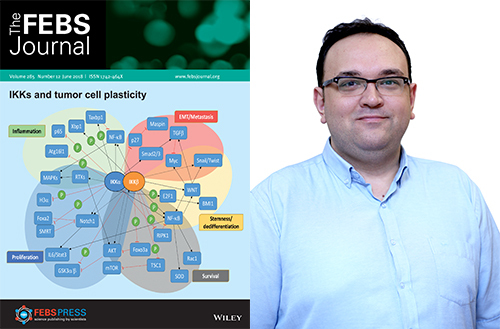 Dr. Serkan Göktuna has been working with inflammatory signaling pathways in cancer for more than 10 years, and his current research extends to identification of novel molecules or signaling pathways regulating interaction within tumor microenvironment.